CASSABLANCA, MOROCCO (CAJ NEWS)--In language rarely seen among nations, some of Donald Trump’s closest allies have attacked an International Monetary Fund (IMF) loan to Mauritania, accusing the country of torture, theft and slavery. Six of Donald Trump’s most senior Republicans in Congress have taken the unusual step of going over the White House and cabinet to condemn one of Washington’s closest allies in Africa. The congressmen have written to Christine Lagarde, head of the IMF, and asked her to end funding to the Islamic Republic of Mauritania in West Africa. Gone is the diplomatic waffle of politics, replaced by a condemnation of President Mohamed Aziz that goes beyond even the tweets of Mr Trump, accusing Mauritania and its government of theft, slavery, corruption and a “heinous human rights record”. The letter dated 5 March was signed by a clutch of names you might not know, but they are men who backed Trump early in his rise, and all are crucial to getting his bills through congress. – Mark Meadows of North Carolina is one of the president’s closest friends and chairs the Freedom Caucus, a 40-strong groups of politicians who have the numbers to make or break legislation. – Thomas Garrett from Virginia is a former army officer and a rising star in the Republican Party. – Jeff Duncan among the strongest supporters of Mr Trump in Congress and sits on the Foreign Affairs Committee, along with Lee Zeldin and Scott Perry, both of whom signed the letter. – Gus Bilirakis of Florida has a name for calling out bad leaders, but not in this kind of language. True, Mr Aziz runs one of the most oppressive governments anywhere, but the US befriends any number of nasties including Djibouti, China and Saudi Arabia. But in what has been dubbed the “Mauritania Memo”, the House appears to have put Mr Trump on notice that in plans to take a more aggressive role. The IMF recently approved a $163m line of credit that Christine Lagarde tweeted would improve living standards for Mauritanians who suffer a level of poverty that’s harsh even by African standards. But the Congressional letter claims this money will “line the pockets” of president Aziz whom it accuses of “rigged contracts” for all types of business along with bribes and corruption. “Up to 20% of Mauritania’s population is estimated to be enslaved, the highest rate worldwide,” the letter says. And it closes with a call for action. “If President Aziz continues to foster an environment unrecognisable to international norms,” then the IMF boss should end funding to ensure the fund does not “become complicit in the Aziz regime”. In Paris where thousands of Mauritanians have fled to exile, protests are common outside the country’s embassy. 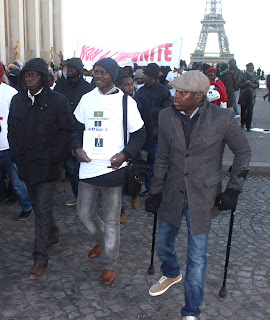 And always there is Thomas N’diaye who has long called on the French government to clamp down on its former colony.